Do you know who's 71 years old today? It's everyone's favorite rabbit, Bugs Bunny. Some of you may have already heard this. I'm betting, though, that this next bit of information is totally new to most of you. As the story goes, Bugs Bunny was born in Brooklyn, New York underneath Ebbets Field- the home of the Brooklyn Dodgers. Heck, according to the hare's original voice actor, Mel Blanc, he used a flatbush accent. So, by right, that makes Bugs Bunny a True Blue Dodger fan. To help celebrate this fine day I though I would put up Bug's debut movie, originally released today in 1940 called "A Wild Hare." Check it out below. 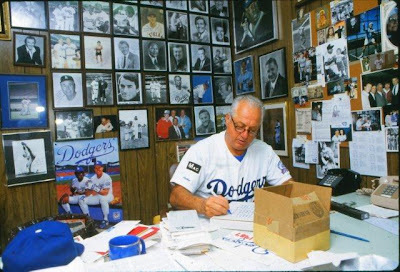 Tommy Lasorda's office, circa 1987. Via @Dodgers yfrog pic. Forbes tells us that MLB is charging the Dodgers twice the rate they charged the Rangers. Night Owl Cards shows off his recently completed 1972 Topps Dodgers team set. One of my favorites. Who knew the Dodgers still owned some real estate in Vero Beach? We find out through TCPalm that the Dodgers have been cited for code violations. It's for a 3.4 acre parcel of land that has no access, other than through a neighbors back yard. I believe it is located across the street from Dodgertown, on the opposite side of 43rd Avenue. per John Heyman at SI, Ron Burkle, thought to be a major financial backer of Garvey's bid to buy the Dodgers, may not actually be in Steve's court. Are you kidding me? An $80 hot dog? Via Huffington Post. (It) is deep fried and rolled in truffle oil, then coated with porcini dust, sprinkled with white truffle shavings, and topped with dollops of creme fraiche, caviar and fresh roe. The Dodgers honored Tim Wallach recently as he entered into the College Baseball Hall of Fame this year. Tim Wallach First Pitch Ceremony from FullertonTitansTV on Vimeo. And I'm putting this up because its brilliant.